Tres - Life is so full of tae! Almost all of our trips were unplanned. But the latest one is the most spontaneous of all. Two days before the long weekend, Jan and I were still unable to decide whether to celebrate our 3rd anniversary in Asik-asik Falls in North Cotabato or Cape de San Agustin in Governor Generoso. Asik-asik falls is unique, stunning, and unspoiled. But a visit there only takes a day and after that there's no place else to go around North Cotabato. Not for a romantic celebration for that matter. Yes, we want to see this together but I think it's best to go there with friends. Cape de San Agustin, on the other hand, could give us the romantic vibe because of the scenic and peaceful beach. But then, two days is already enough for that trip. And we have four days to spend. Two days after that discussion, we flew all the way from Davao to Palawan and had the best, amazing (and dramatic) time of our lives. P.S. My winning coupon from Traveloka's Blog Contest really helped in making this trip happen. I think it's just timely that I won for that week. I mean, I was hesitant to submit my entry sooner and want to strategically submit it on the last week of submission. And I was even a little sad when I learned I was chosen the fifth weekly winner thinking it made my chances of winning the Grand Prize slim. But then, I'm glad I did because the timing is just so perfect. An unexpected El Nido getaway for our third year anniversary? I wouldn't mind not winning the grand prize at all (although I'm still crossing my fingers I would). kuyawa ba. mura ma'g sa tagum ra ang palawan. pang #relationshipgoals ning inyo. congrats sarj! 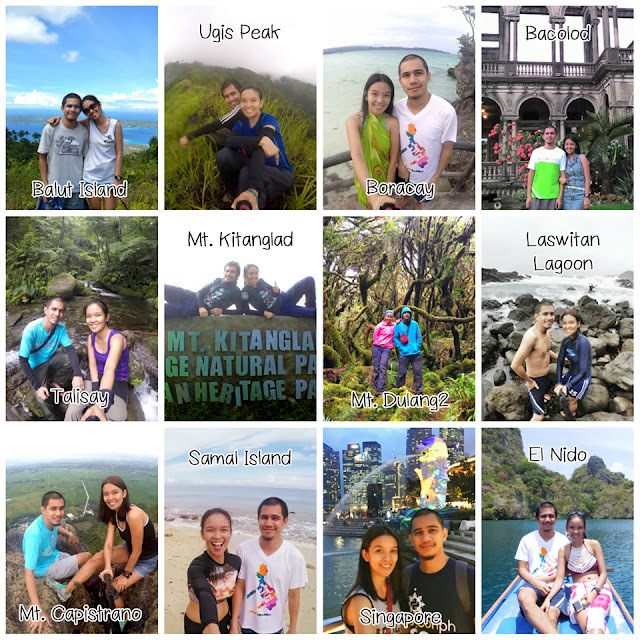 traveling couples. my kind of relationship. congratulations to both of you!! !